This past year I travelled to the high arctic. Aboard the ship the Ocean Endeavor, I floated between sea-ice and glacier as a passenger of time not a maker. The ice cores and glaciers record time past and then melt into the present. 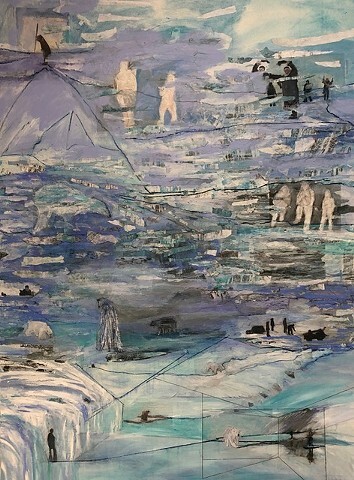 Going to the arctic I am a keeper of time in my paintings. Like the ocean and ice, my images expand and recede; in and out of spatial realms like the polar bear moves between ocean and ice. In this true north there is the magnetic north that moves my paint and brush freely in response to the earths magnetic field. It moves the worlds on the canvas from place to place not fixed. The north magnetic pole is a wandering point on my canvas surface and Earth. I invite you to venture north with me to create your own stories.